Paintable Edging is a practical alternative to expertly finish the edge of MDF and other boards. It is quick, clean and gives a perfect & professional looking edge. It is suitable for painting and spray painting and all types of paints can be used, water and solvent based. Available in many widths and lengths, pre-glued and un-glued. Iron on or use with edgebander machines. Want to learn more? 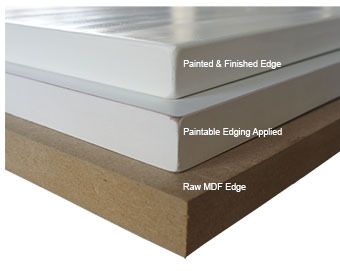 Read our blog post Finishing MDF Edges.